From the movie Righteous Kill the tag line is “There’s Nothing Wrong With A Little Shooting As Long As the Right People Get Shot“…sure that’s Hollywood, but it seems this could be applied to the law enforcement investigation of Seattle Detective Ron Smith whose felony assault charges for shooting a member of the Hells Angels motorcycle club in Sturgis were dismissed yesterday. “the investigation that I have reviewed indicates he (Smith) was assaulted and it was premeditated.” The investigation established that Detective Smith was defending himself from a violent pre-meditated attack and he responded in a manner which was neither excessive nor unreasonable under the circumstances. While the case illustrates reserving final judgment until all facts are examined it leaves some unanswered questions about how much, if any, the Sturgis incident was influenced by Smith’s testimony in a Hell’s Angel federal racketeering and murder trial in Seattle last year which sent several former and current members of the motorcycle “club” to prison ranging from seven years to life without parole. Or how much the decision to dismiss the assault charges were based on the lack of cooperation of the HAMC who wouldn’t testify before the grand jury? The Seattle Times (Jennifer Sullivan) reports HERE that Court records and police testimony indicate Smith has clashed with another Hells Angel back in 2005. Authorities filed charges alleging that Anthony James Magnesi, a member of the Washington Nomads chapter of the Hells Angels, had threatened Smith over the phone. The end result from an internal investigation dismissed misdemeanor charges filed against Magnesi and Smith was referred to his supervisor for a training issue. Much more on the Magnesi clashes HERE. Detective Smith will return to full active duty (he was on administrative leave pending results) and obviously the Seattle Police Officers Guild is happy with the outcome and issued a press release HERE. I don’t know about you, but I’m a bit conflicted and feeling this outcome is anti-climatic. 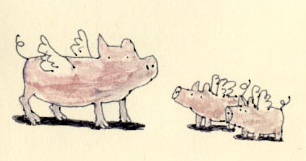 Does this mean the Iron Pigs won’t return to Sturgis next year? 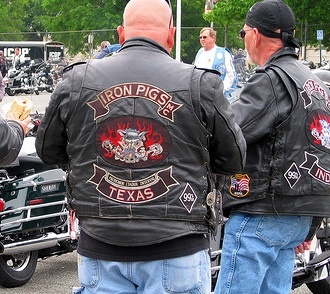 Can the motorcycle events industry afford yet another motorcycle “club” clash? Operator, I need Mr. Happy. Now! Update: November 18, 2008 – Weapons charges dropped. See HERE for more info. Update: May 7, 2010 – Detective Ronald Smith has filed a lawsuit against the city of Seattle and the Seattle Police Department. Even though all charges were dropped the suit alleges the department disparaged him and negligently provided false information that led to his indictment on a perjury charge. This was an embarrassment and the lawsuit contends his reputation was harmed. 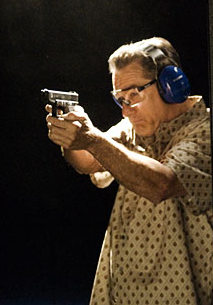 Photo courtesy of the movie Righteous Kill web site. The Seattle Times is reporting that the off-duty police officer who shot Hells Angel member Joseph Patrick McGuire (33, of Imperial Beach, Ca.) 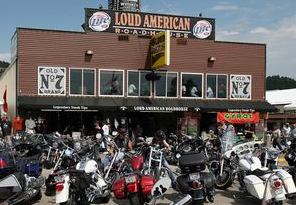 at the Loud American Roadhouse in Sturgis was forced to open fire after being attacked and pinned to the floor by up to three members of the outlaw motorcycle gang. According to the newspaper, 25 people testified during the seven-hour court hearing. No arrests have been made and the investigation could continue until the grand jury reconvenes on Aug. 27th. Not everything is as tranquil as they would want us to believe…new information has been released on the detective involved in the Sturgis shooting has twice been investigated by the department of Office of Professional Accountability, a civilian police-oversight group, during his 15 years on the force. Both complaints were confirmed by the group. One investigation stemmed from a verbal argument he got into with a Seahawk fan while working an off-duty assignment at Qwest Field in 2004. He also got into an argument inside a Pierce County restaurant in 2005 with a restaurant employee who was taunting and threatening him and his then-fiancée. He received a two-day suspension for the incident with the Seahawk fan and a written reprimand for the other incident. I’ve received a number of questions about whether it was legal for Smith to have a gun on him in the Loud American Roadhouse, because he was off duty at the time. According to South Dakota law, people with concealed-weapons permits cannot carry firearms into bars. Police officers are exempt from this rule if they have written permission from the county sheriff, according to the law. However, the Law Enforcement Officers Safety Act (a federal law) enacted in 2004 supersedes the state law, allowing off-duty law-enforcement officers to carry weapons anywhere they choose, but it requires that the weapons handler not be under the influence of drugs or alcohol. Update: August 14th – Seattle PI is reporting that Hells Angel member Joseph Patrick McGuire was arrested Jan. 18, 2007, as part of an investigation by the Drug Enforcement Administration and the San Diego Police Department. Police served warrants on two San Diego-area homes that belonged to the president of the Hells Angels’ local chapter. McGuire is the chapter treasurer and was arrested at one of the homes in Pacific Beach, Calif. Police seized a pound and a half of marijuana, in addition to hydrocodone and oxycodone pills, and $5,000 in cash. The San Diego chapter president and vice president were charged in separate cases in the investigation. McGuire was released on bond and scheduled for a pre-trial hearing Aug 20 in San Diego County Superior Court, with his trial set for September. He was charged with possession of marijuana for sale and two counts of illegal possession of narcotics. Update: September 5th – The Argus Leader is reporting that both men (McGuire (HAMC) and Smith (Iron Pigs)) are charged with alternative counts of aggravated and simple assault. Smith was also charged with perjury. In addition, misdemeanor gun charges were also brought against the four other fellow bikers with Smith (also part of the Iron Pigs): Scott Lazalde (Bellingham, WA); Dennis McCoy (Seattle, WA); Erik Pingel (Aurora, CO) and James Rector (Ferndale, WA). Update: September 9th – The Seattle.pi is reporting that the perjury charge has been dismissed against Smith. The grand jury indicted Smith last month on charges of aggravated assault, perjury and illegal possession of a concealed weapon. Smith initially stated he was carrying his personal firearm, but the Seattle Police Department records contradicted him, showing that it was a department-issued gun. This was the evidence that was presented which resulted in the perjury charge. Update: September 17th – Aggravated assault charges dropped. See HERE for more info. Update: November 18, 2008 – All weapons charges dropped. See HERE for more info. Update: February 25, 2009 – In a plea agreement Joseph McGuire (HAMC) pleads no contest to simple assault (versus aggravated assault) and was sentenced to one year in the Meade County Jail. According to Rapid City Journal, McGuire’s sentence was suspended as long as he does not break the law. No fines were imposed, but he can not attend this years rally. The Seattle PI reported yesterday that an off-duty Seattle police officer attending the Sturgis Rally was detained in a shooting that left a Hells Angels MC member injured early Saturday morning. UPDATE: Sturgis Police identified the Hells Angels member as 33 year old Joseph McGuire of Imperial Beach, CA. 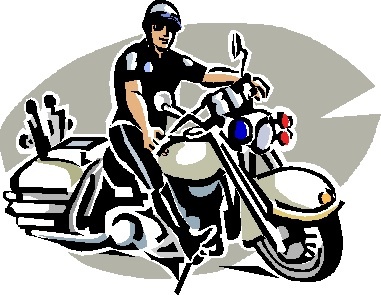 The police officer is a member of the Iron Pigs Motorcycle club which is open to all law enforcement and firefighters who own and ride a V-Twin. It was reported that as many as 500 people were inside the club when officers from several agencies converged on the bar, evacuating patrons and securing the club. Dean Kinney, one of the bar’s owners, told the Rapid City Journal in Rapid City, S.D., that workers at the bar noticed several Hell’s Angels gathering in and outside the bar, and actually called police prior to the shooting as a precaution. The Sturgis rally has a reputation, but Saturday’s shooting is the first to take place during the rally in nearly 20 years. An unfortunate way to end the rally. I plan to follow this story and watch if the “spin” machine goes into overdrive! 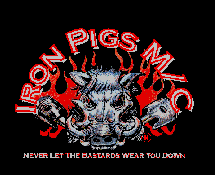 Update #1: more background on the Iron Pigs M/C HERE. Update #2: Sturgis Police identified the Hells Angels member as 33 year old Joseph McGuire of Imperial Beach, CA. Police are not releasing the Seattle Policeman name out of fears of his safety. Update #3: The Rapid City Journal identified the Seattle police officer as Ronald Smith (43, of Seattle, WA). More info posted HERE. Update #4: August 14th – Seattle PI is reporting that Hells Angel member Joseph Patrick McGuire was arrested Jan. 18, 2007, as part of an investigation by the Drug Enforcement Administration and the San Diego Police Department. Police served warrants on two San Diego-area homes that belonged to the president of the Hells Angels’ local chapter. McGuire is the chapter treasurer and was arrested at one of the homes in Pacific Beach, Calif. Police seized a pound and a half of marijuana, in addition to hydrocodone and oxycodone pills, and $5,000 in cash. The San Diego chapter president and vice president were charged in a separate cases in the investigation. McGuire was released on bond and scheduled for a pre-trial hearing Aug 20 in San Diego County Superior Court, with his trial set for September. He was charged with possession of marijuana for sale and two counts of illegal possession of narcotics. Update #5: August 15, 2008 – Seattle Times is reporting that Smith testified against the HAMC in a high-profile racketeering and murder case last year. His testimony was characterized as “pretty periphery” to the case, however, suggestions were hinted that the Sturgis confrontation could be linked. Update #6: September 5, 2008: The Argus Leader is reporting that both men (McGuire (HAMC) and Smith (Iron Pigs)) are charged with alternative counts of aggravated and simple assault. Smith was also charged with perjury. In addition, misdemeanor gun charges were also brought against the four other fellow bikers with Smith (also part of the Iron Pigs): Scott Lazalde (Bellingham, WA); Dennis McCoy (Seattle, WA); Erik Pingel (Aurora, CO) and James Rector (Ferndale, WA). Update #7: September 9, 2008 – The Seattle.pi is reporting that the perjury charge has been dismissed against Smith. The grand jury indicted Smith last month on charges of aggravated assault, perjury and illegal possession of a concealed weapon. Smith initially stated he was carrying his personal firearm, but the Seattle Police Department records contradicted him, showing that it was a department-issued gun. This was the evidence that was presented which resulted in the perjury charge. Update #8: September 17, 2008 – Aggravated assault charges dropped. See HERE for more info. Update: #9: November 18, 2008 – All weapons charges dropped. See HERE for more info. Update: #10: February 25, 2009 – In a plea agreement Joseph McGuire (HAMC) pleads no contest to simple assault (versus aggravated assault) and was sentenced to one year in the Meade County Jail. According to Rapid City Journal, McGuire’s sentence was suspended as long as he does not break the law. No fines were imposed, but he can not attend this years rally. Update: #11: May 7, 2010 – Detective Ronald Smith has filed a lawsuit against the city of Seattle and the Seattle Police Department. Even though all charges were dropped the suit alleges the department disparaged him and negligently provided false information that led to his indictment on a perjury charge. This was an embarrassment and the lawsuit contends his reputation was harmed.